Reason 2: If you want your blog to be included in Google News, the permanent URL of your blog posts must contain a unique number consisting of at least three digits. Taking the example above, it would very ugly if your frame the post title something like "83203 My Favorite Google Search Tips" just to ensure that the number 83203 comes in your page address. What you really want is a post title with no number but a modified permalink like 83203-google-search-tips.html that has the mandatory number and the important keywords. How it can be done - Compose a new blog post in either Windows Live Writer or the web-based interface of your blog software. Keep the title of the post as "Tips Increase Adsense Income" and publish it on the blog. Now open this post for editing in Windows Live Writer and change the title to "How to Increase My Adsense Income". Publish it back to your weblog by pressing Ctrl+P. Your blog post and url remains the same but the title will change to keep both your blog audience and the search engine spiders happy. How it can be done - It's the same method. When you publish the post for the first time on your blog, keep the title of the post as "8328 Tips Increase Adsense Income". 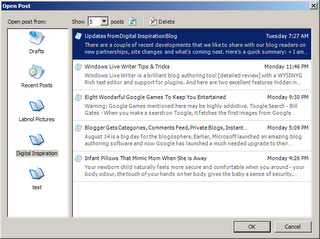 Now open it inside Windows Live Writer and change the title to "How to Increase My Adsense Income". Republish. It now has a more meaningful title and Google News friendly URL. The above method cannot be used for changing the webpage address on MSN Live Spaces blogs since they have no connection with the blog post title.